In the KB section we see that hydrotropes and solubilizers generally are worse if there is self-association. Here we have a specific (and rather rare!) example of where self-association, the formation of surfactant micelles, is at the heart of the effect. Using a relatively simple model, it is possible to get some insights into what is really happening. Naive ideas of the solute going into the "hydrophobic core" can readily be rejected for many solutes via a comination of common sense and calculations. To get you started, just slide the CMC (Critical Micelle Concentration) value to see that it doesn't make all that much difference to the overall solubility, then the MSR (Molar Solubilization Ratio) which is the really important parameter and the one, currently, where we know almost nothing. A key challenge for future researchers is to find ways to predict the MSR. The parameters in the second row are all to do with extracting extra information from the solubility curve. You often read that surfactants act as hydrotropes because they form a micelle with a hydrophobic core and a "hydrophobic" molecule "therefore" dissolves within the core. The first part is true - surfactants do indeed form micelles with a hydrophobic core. The second part is clearly nonsense for most solutes requiring hydrotrope assistance. Although a typical drug molecule might be "hydrophobic" that doesn't mean that it is soluble in hexadecane, which is what the core of a C16 surfactant must be like. Given that most solutes aren't soluble in typical surfactant heads such as the tetralkylammonium head of CTAB (cetyl tetramethylammonium bromide) or the sulphate head of SLS (sodium lauryl sulfate), [though perhaps somewhat soluble in the PEO head of Tweens and Brijs], any solubility conferred by micelles must be something to do with the interfacial layer. 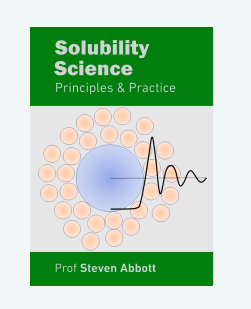 Although the theory of hydrotropy via surfactants can be described well in the app below, the rules of (and meaning of) solubility in the interfacial layer are comparatively unknown and subject to much post-facto rationalisation. To analyse the surfactant hydrotrope effect, the approach used by Dar, Das & Rather at U. Kashmir is followed. They have an interesting series of papers covering truly core-soluble molecules such as naphthalene through to molecules such as erythromycin which positively avoid the core. Their paper on naproxen covers a molecule which is intermediate (it has a naphthalene moiety and a relatively hydrophilic portion) and should be the starting point for those interested in the details of their approach1. Although this particular paper focusses on surfactant blends, there is a lot of single-surfactant data and the blends, though important for those wanting to optimise solubilities, do not represent different basic phenomena but rather highlight the point discussed elsewhere that additions of other molecules to a surfactant system can significantly increase overall solubility via (simplistically) decreasing the CMC. Although their calculation of MSR and Km is conventional, they include a whole package of other calculations such as the volume and area values discussed below.
. For graphing purposes the maximum wt% surfactant is also needed. Next is the Molar Solubilization Ratio, MSR, which is the number of solute molecules solubilized per surfactant molecule. Obviously in experiments this is a value calculated from the data, but here it is an input to allow an exploration of all the key values. MSR controls the solubility, S, in the presence of a concentration C of hydrotrope via: S-S0 = MSR(C-CMC). Finally there are the parameters specific to the solute: S0 is the solubility in the absence of surfactant (and is assumed to be constant up to the CMC), Volume is the volume of a solute molecule and Area is the solute's surface area. Km which is the effective partition coefficient between the water and the micelle, shown in Log10 format as it is generally a large number. The default values for the app are those of Naproxen with CTAB as the surfactant. The MWt merely shifts the solubility curve because the CMC is in µM but the graph is shown in the more helpful % surfactant. For a given CMC a higher MWt requires a higher % surfactant to gain solubility. Because a low CMC gets the process off to a good start it seems a great advantage to choose a surfactant with a low value - but the MWt is also important; often it's better to sacrifice some CMC to have a lower MWt so one's % surfactant doesn't need to be so high. The Dar & Rather paper on aromatic hydrocarbons shows that typically 16 naphthalene molecules are taken in to one of their micelles, taking up just 8% of the volume, a plausible scenario. But for erythromycin the 136 molecules per micelle far exceed the volume of the core, yet take up just 80% of the surface area, consistent with the common-sense view that the molecule is highly unlikely to have any solubility in "hexadecane". For Naproxen/CTAB the Core is ~10% and the Surface is 30%, both reasonable so impossible to draw any conclusions as to where the solute might be. The great thing about surfactant solubility improvements is that they are obtained at relatively low % concentrations (2-10% rather than 10-50% for small-molecule hydrotropes). However, within this range they tend to be factors of 5 improvements, not factor of 50. As you get to higher % surfactant you tend to run in to problems of "mesophases", opaque, viscous clusters of cylinders and lamellae. The solute binding to the micelle surface also tends to change the shape from spherical to cylindrical, with an increase in viscosity. Another way to put the previous point is that MSR values tend to hover in the region of 0.2. However there are cases where the value is greater than 1 in which case the boost to solubility starts to be significant. For those wondering where the volume and area calculations come from, the Tanford equation is used for the radius of the micelle r=1.5+1.265n where n is (generally) one less than the nominal number of surfactant carbons, with the assumption that the first carbon is effectively in the head. From r it is easy to calculate the volume and surface area of the micelle.